Compilations are always a tricky business. 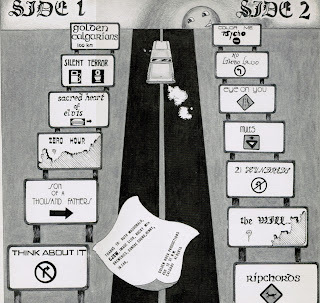 But this one - which is just over 25 years old now - seems to have hit the mark, with most of our favourite bands from the era captured. We don't know how this came about - other than it was put out on Golden Rock records, the same label that put out the first Golden Calgarians releases. 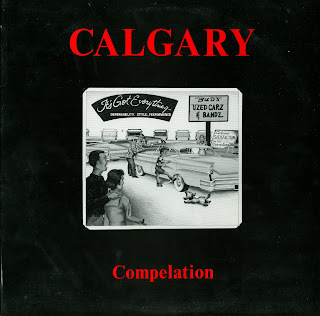 Golden Calgarians: "Party in the Sun"
Silent Terror: "Money Makes the World Go Round"
Sacred Heart of Elvis: "Black Snake Moan"
Son of a Thousand Fathers: "Shuttle"
Think About It: "John's Piano"
Color Me Psycho: "Stiff All Over"
Eye On You: "Human Rights"
21 Hundreds: "Life is Eternal"
The Will...: "Nice Try. Now Quit"
Sir: can you explain the cover art? 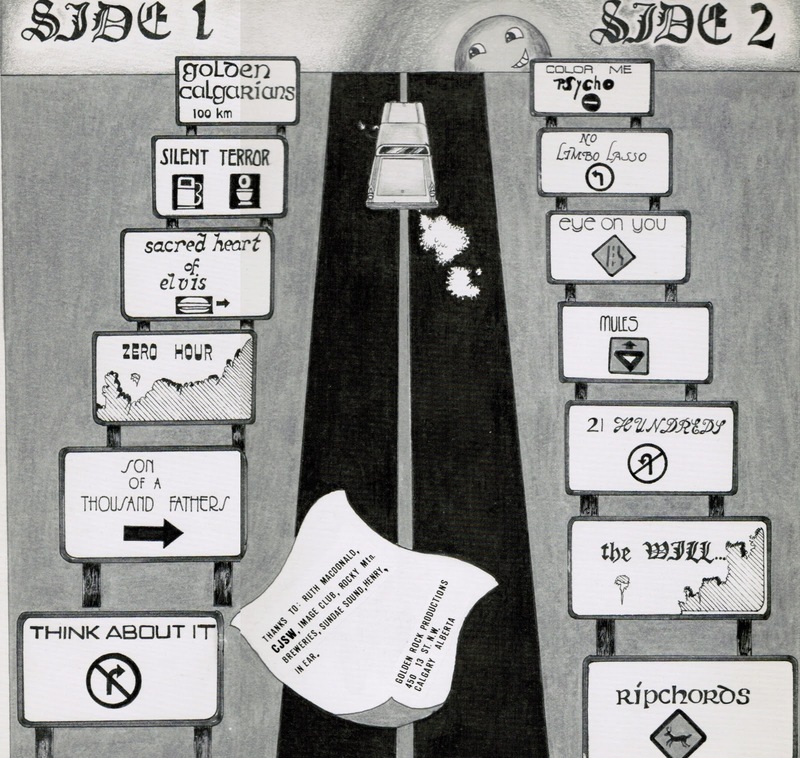 I can't unpack the cover art (which only listed the bands on the back cover, and only listed the song titles on the record label--making the LP a DJ's worst nightmare!) any more than I can explain the infamous title typo. Unless there was some well-intentioned, but ultimately doomed, word coinage going on...a "compelling compilation"? Shadoplay performed at Ace of Clubs in 1986 and was recorded by Les Siemieniuk with CBC. Grant Sim did the live sound.